George Washington used a little log building, now the middle room of George Washington's Office Museum, as a military office from September 1755 to December of 1756 while Ft. Loudoun was being constructed at the north end of town. Washington planned Ft Loudoun, supervised the work and brought his own blacksmiths from Mount Vernon to do the iron work. 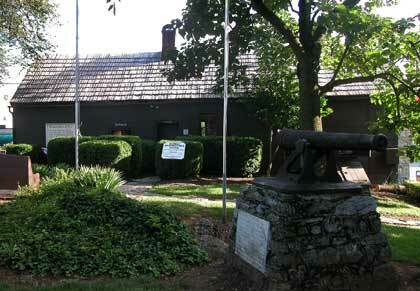 The fort was a redoubt with four bastions; there were fourteen mounted cannon and it covered one-half acre. It was made of logs filled with earth and inside there were barracks for 450 men. A well was sunk 103 feet through solid limestone rock to supply the fort with water. This well, now on private property is all that remains of the fort today. It was considered a strong fort and was never attacked. 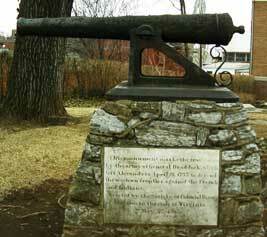 Located on the grounds of the office is a cannon which was left by General Edward Braddock in Alexandria. It is among a number of interesting artifacts displayed at the office. The current exhibit is entitled "George Washington and the West". The display includes some of Washington's personal effects, surveying equipment and a scale model of the town of Winchester circa 1755 which shows the fort prominently located at the north end of the town on a slight hill. Winchester played an important role in George Washington's early adult life; his military and political career began here. As a young man of sixteen, he came to the area to begin what he thought would be his life's profession, surveying. With the earnings from his surveying business he was able to buy a number of acres around Frederick County and also a lot in the town that enabled him to served as a Burgess from Frederick County from 1758-1765. During the French and Indian War he commanded the Virginia Regiment from his headquarters in Winchester. Finally, after the fall of Ft. Duquesne in 1758 and his having inherited his half-brother's home, he retired from military service to marry Martha Custis and take up the life of a planter at Mount Vernon. 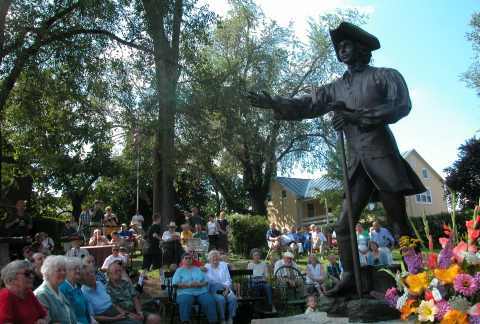 On Saturday, July 24, 2004 The Winchester-Frederick County Historical Society dedicated a statue of the young surveyor George Washington that is now mounted next to the Office Museum. It is very appropriate that this early period of Mr. Washington's life should be so honored in the area where he spent so much time during the crucial, formative years. Hours: April 1 - Oct. 31: Mon.-Sat. 10 a.m. to 4 p.m.; Sun. noon to4 p.m.
Website: George Washington Office Museum.